Patrick McDonnell’s Little Red Cat and George Herriman’s Krazy Kat — Relatives? 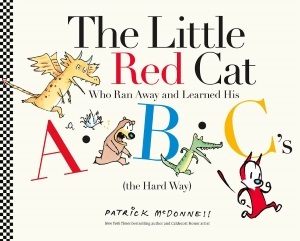 Reading Roger’s Sutton’s post about Patrick McDonnell’s Caldecott chances for his delightful The Little Red Cat Who Ran Away and Learned His ABC’s (the Hard Way)*, made me think fondly of McDonnell’s illustrations for the Mac Barnett-penned The Skunk which I, along with my follow jurors Marjorie Ingall and Frank Viva, honored with a New York Times Best Illustrated nod back in 2015. Both these books and other work by McDonnell have always felt to me full of sly homages to the George Herriman comic, Krazy Kat which ran from 1913 to 1944. So today I did some poking around a bit and learned that MacDonnell is a longtime and serious fan, witness his 1986 Krazy Kat: the Comic Art of George Herriman (You can read an essay adapted from the book here). And then, for another layer, I came across Gabrielle Bellot’s “The Gender Fluidity of Krazy Kat” and Chris Ware’s “To Walk in Beauty”, reviews of Michael Tisserand’s recent award-winning biography Krazy: George Herriman, a Life in Black and White. In these I learned that both gender fluidity and race are aspects of this ground-breaking comic that so clearly inspires Patrick MacDonnell. Here’s a taste of Herriman’s strip, one from 1917 in which Krazy gives pal Ignatz a smooch. A wonderful added bit of depth to a worthy Caldecott contender this year. *Check out this delightful video of a book chat I was honored to feature, between Mcdonnell and Victoria Stapleton. I was over the moon when I learned your trio had named THE SKUNK on your Best Illustrated picture book list of 2015, and I am a huge admirer of Mr. McDonnell. 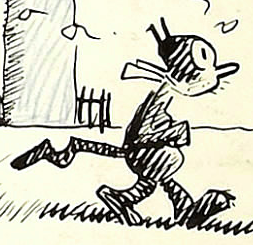 Will check out your video now and much appreciated this connection to Krazy Kat!!! In any case this new ABC book looks like a major contender to me!